Objectives High-sensitivity troponin (hs-cTn) is substituting conventional cTn for evaluation of chest pain. Our aim was to assess the impact on patient management and outcome. Methods A total of 1372 consecutive patients presenting at the emergency department with non-ST-elevation acute chest pain were divided into two periods according to the cTn assay used, conventional (n=699, March 2008 to July 2010) or hs-cTn (n=673, November 2010 to March 2013). Management policies were similar and according to guidelines. The primary endpoint was major adverse cardiac events (MACE) at 6 months (death, myocardial infarction, readmission by unstable angina or postdischarge revascularisation). Results There were minor differences in baseline characteristics. In the hs-cTn period, more patients elevated cTn (73% vs 37%, p=0.0001) leading to more coronary angiograms (77% vs 55%, p=0.0001) and revascularisations (45% vs 31%, p=0.0001); conversely, fewer patients were initially assigned to exercise testing (14% vs 36%, p=0.0001) and, therefore, discharged early after a negative result (7% vs 22%, p=0.0001). At 6 months, 135 patients suffered MACE, including 54 deaths. After adjusting for a Propensity Score, hs-cTn use was not significantly associated with MACE (HR=0.99; 95% CI 0.70 to 1.41; p=0.98) or mortality (HR=1.02; 95% CI 0.59 to 1.77; p=0.95), though the risk of longer hospitalisation stay increased at the index episode (OR=1.35, 95% CI 1.07 to 1.71, p=0.02). Conclusions hs-cTn simplified chest pain triage on avoiding a more complex evaluation with non-invasive tests in the chest pain unit, but prompted longer hospitalisations and more invasive procedures without impacting on the 6-month outcomes. Due to this better accuracy, hs-cTn allows the identification of some high risk patients from within the vast population of acute chest pain who would otherwise go undetected using conventional cTn.5–7 In addition, cTn release can be detected as early as 2 h from AMI onset.8–10 However, ruling in AMI when hs-cTn is mildly elevated or ruling out unstable angina when hs-cTn is normal remains matters of debate. Currently, hs-cTn is substituting conventional cTn in many hospitals, but there is scarce information regarding how this change is modifying patient management and outcome. Some data suggest that hs-cTn use might improve patient prognosis, but more information is needed to confirm these findings.11 In this study, two consecutive series of patients with acute chest pain managed with conventional or hs-cTn assay were compared. The main purpose was to investigate the impact of hs-cTn on postdischarge outcome as well as on the inhospital diagnostic work-up and management. This prospective cohort study included 1372 patients who presented at the emergency department with acute chest pain. The study group comprised two cohorts corresponding to different periods according to the cTn assay used: (1) the conventional cTn period (from 1 March 2008 to 1 July 2010, n=699) and (2) the hs-cTn period (from 1 November 2010 to 1 March 2013, n=673). In the time interval between the two periods, a different provisional cTn assay was used until the new high-sensitivity assay was implemented, and these interim patients were not considered. The study was reviewed and approved by the ethics board of the University Clinic Hospital of Valencia. In both periods, consecutive patients presenting at the emergency department with a chief presentation of chest pain considered by the cardiologist on duty to be of possible coronary origin were included. The clinical screening process involved a first evaluation by a member of the emergency staff to determine if the chest pain was of obvious non-cardiac origin (eg, muscular, skeletal or pleuritic pain). The remaining conditions were initially considered as of a possible cardiac origin. At the second evaluation, the cardiologist on duty excluded clinical settings suggestive of cardiac diseases other than coronary heart disease (such as pericarditis or acute aortic dissection) and, finally, patients were included in the registry.12–14 Other exclusion criteria were: (1) ST-segment elevation in the initial ECG suggesting AMI and (2) prior known heart disease other than coronary artery disease (such as heart valve disease or cardiomyopathy). The management protocol was identical in the two cohorts, consisting of the successive evaluation of the initial ECG, serial cTn tests and early exercise testing for those patients without ECG ischaemia or cTn elevation and who were able to exercise.12–14 Ischaemic changes in the initial ECG were considered if ST-segment depression was ≥1 mm or T wave inversion was ≥1 mm. Serial cTn determination was performed upon arrival and later according to the physician's criterion. The recommendation for the second cTn measurement was at 8 h after patient arrival in the conventional cTn period and at 6 h in the hs-cTn period. Patients with cTn elevation were hospitalised with a diagnosis of non-ST elevation AMI and were scheduled for a coronary angiogram. Patients with a negative cTn result but with ECG ischaemia were also hospitalised and underwent cardiac magnetic resonance with dipyridamole or a coronary angiogram, as directed by the attending physician. In the absence of ischaemia in the ECG or of cTn elevation, patients were assigned to an early exercise test or were hospitalised for further evaluation in the case of any contraindication to exercise. Those patients with a negative result in the exercise test were directly discharged. All patients with acute coronary syndrome diagnosis received antithrombotic treatment consisting of dual antiplatelet therapy (aspirin and clopidogrel) and enoxaparin. In the conventional cTn period, the cTn-I Siemens Dimension RxL assay (Dade Behring, Newark, Delaware, USA) was used. With this assay, the 99th percentile value of a reference population is at 70 ng/L, while the precision limit with a 10% coefficient of variation is at 140 ng/L. In our institution, following the recommendation of the manufacturer, the cut-off selected for AMI diagnosis was 200 ng/L. In the hs-cTn period, the Elecsys hs-cTn-T assay (Roche Diagnostics, Basel, Switzerland) was used. With this assay, the precision limit is at 14 ng/L. This value also corresponds to the 99th percentile cut-off and was used for AMI diagnosis. Clinical data were collected at admission. The length of hospital stay (LOS, days), number of diagnostic and revascularisation procedures performed and medical treatment at discharge were also recorded. The main outcome was major adverse cardiac events (MACE) at 6 months, including all-cause death, readmission for AMI, readmission for unstable angina and postdischarge revascularisation. AMI was defined by a new episode of acute chest pain with cTn elevation.2 Readmission for unstable angina was considered in case of rehospitalisation by suggestive chest pain with evidence of ischaemia in the imaging ischaemia test or significant stenosis in the coronary angiogram. Postdischarge revascularisation was considered if coronary angioplasty or coronary surgery was performed during follow-up. Secondary outcomes were 6-month mortality and the LOS at the index episode. Periprocedural myocardial infarction was also registered and defined by an increase of creatine kinase isoenzyme (CK-MB) >3 times after coronary angioplasty or >5 times after coronary surgery at 8 and 24 h after the procedure. Information on the endpoints was collected in the outpatients’ department. In patients who did not return to the outpatients’ department, the information was obtained by establishing contact with the patient, his or her general physician or the regional registry on mortality. A total of 9 (1.3%) patients were lost at the follow-up in the hs-cTn period and 3 (0.4%) were lost in the conventional cTn-period. The baseline characteristics of the patient population were compared between the two study periods, using the χ2 test for categorical variables and unpaired t test for continuous variables. Likewise, patient management was also compared between these periods. The pretreatment variables of the PS included: age (years), male gender, admission heart failure, ≥2 pain episodes in 24 h, hypertension, current smokers, hypercholesterolaemia, diabetes, family history of ischaemic heart disease, prior myocardial infarction, prior percutaneous coronary intervention, prior coronary surgery, prior admission for heart failure, peripheral artery disease, prior stroke, ST-segment depression, T wave inversion and serum creatine (mg/dL). The variables used for the creation of the PS were selected based on three criteria: (1) clinically they are predictors of the treatment strategy (hs-cTn vs conventional), (2) most of them are also predictors of the outcome (MACE) and (3) they are temporally aligned with the treatment (none of them are consequence of the treatment). The PS discrimination was evaluated by estimating the area under the receiver operating characteristic curve (0.9171). As a calibration measure, the Hosmer–Lemeshow test was estimated (p=0.21). A PS-weighted survival parametric regression analysis was carried out for determining the prognostic effect that the study period had on either all-cause death or MACE.17 The HR and 95% CI were calculated. In addition, a PS-weighted survival function at each study period was estimated for each clinical endpoint, and depicted in figures 1 and 2. 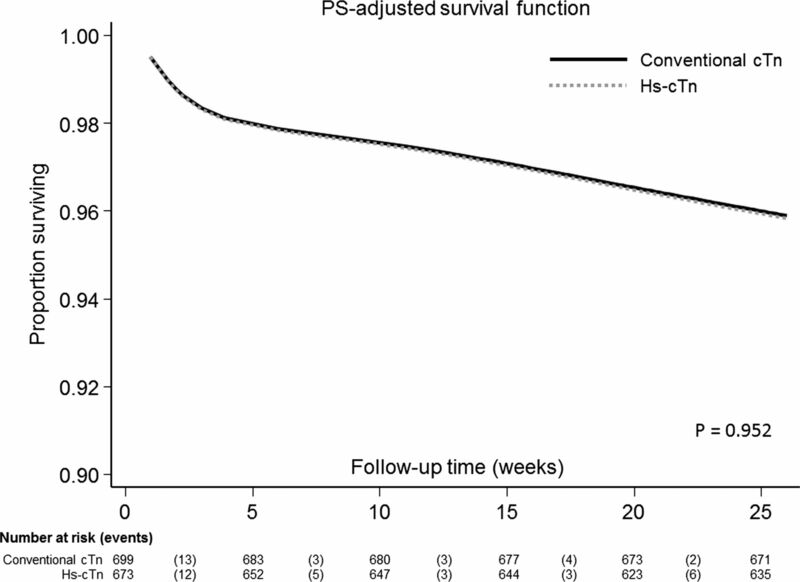 Comparison of PS-weighted survival functions for MACE between conventional cTn and hs-cTn periods. Bottom: Number of patients at risk at each time point. Nine patients were lost at the follow-up in the hs-cTn period and three patients in the conventional cTn period. cTn, troponin; hs-cTn, high-sensitivity troponin; PS, Propensity Score. MACE, major adverse cardiac events; P, statistical significance. 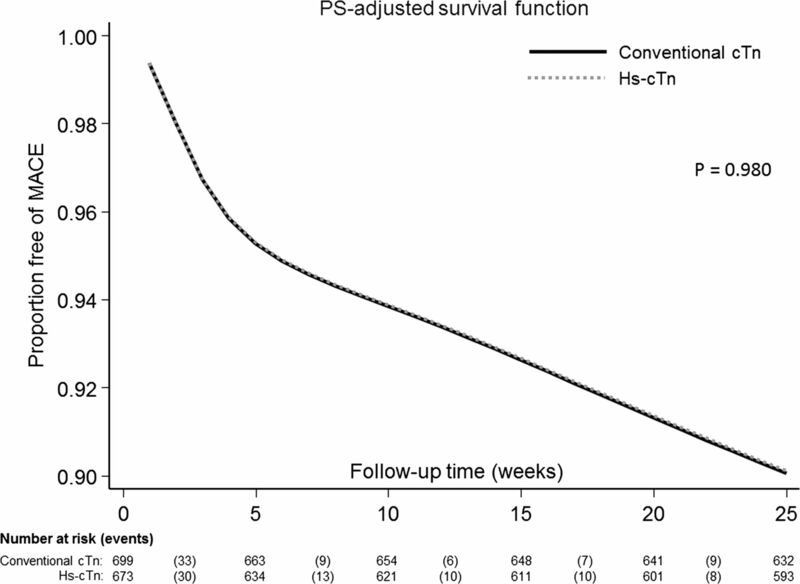 Comparison of PS-weighted survival functions for mortality between conventional cTn and hs-cTn periods. Bottom: Number of patients at risk at each time point. Nine patients were lost at the follow-up in the hs-cTn period and three patients in the conventional cTn period. cTn, troponin; hs-cTn, high-sensitivity troponin; PS, Propensity Score; P, statistical significance. A PS-weighted multivariable binary logistic analysis was also performed to analyse the relation between the study period and LOS at the index episode. To this effect, the continuous variable LOS was dichotomised taking the median value as cut-off (≥5 days). Results for this analysis are expressed as OR and 95% CI. A two-sided p value of <0.05 was considered to be statistically significant for all analyses. All analyses were performed using STATA V.12.1 (StataCorp. 2011. Stata Statistical Software: Release 12. College Station, Texas, USA: StataCorp LP) and R (R Development Core Team (2013). R: A Language and Environment for Statistical Computing. R Foundation for Statistical Computing, Vienna, Austria. ISBN 3-900051-07-0, URL http: //http://www.R-project.org/). Table 1 shows the baseline characteristics of patients in both periods. Patients belonging to hs-cTn period were slightly older (67.9±13.0 vs 65.8±12.6 years, p=0.002) and exhibited higher rates of hypertension (71% vs 62%, p=0.0001), hypercholesterolaemia (60% vs 51%, p=0.001) and prior percutaneous coronary intervention (20% vs 11%, p=0.0001). As a whole, it was a medium risk population according to the thrombolysis in myocardial infarction (TIMI) risk score (conventional cTn period=2.4±1.5; hs-cTn period=3.0±1.5 points). The distribution of patient risk within each period (low=0–1, medium=2–4 and high=5–7 points) was as follows: conventional cTn period=29%, 63% and 8%; hs-cTn period=16%, 69% and 15%. When considering the figures of the TIMI risk score, it must be taken into account that cTn elevation, one of the score's variables, was more frequent using the hs-cTn assay due to the characteristics of this assay, leading to higher scores. Table 2 illustrates patient management. cTn elevation rate was twofold higher in the hs-cTn period (73% vs 37%, p=0.0001); this fact prompted a higher number of coronary angiograms (77% vs 55%, p=0.0001) and, consequently, a higher number of revascularisations (45% vs 31%, p=0.0001). In contrast in the conventional cTn period, more patients were initially assigned to exercise testing evaluation (36% vs 14%, p=0.0001), which facilitated a higher rate of early discharges because of a negative exercise test result (22% vs 7%, p=0.0001). Unstable angina was diagnosed in 142 (20%) patients in the conventional cTn period but in 54 (8%) in hs-cTn period (p=0.0001). The use of recommended medications for acute coronary syndromes at discharge was more frequent in the hs-cTn period (table 2). During the 6-month follow-up, 54 patients died and 135 suffered MACE. Table 3 presents the distribution of events in both study periods. The PS-weighted regression analyses revealed no differences between the two study periods with regard to risk of death (HR=1.02; 95% CI 0.59 to 1.77; p=0.952) or MACE (HR=0.99; 95% CI 0.70 to 1.41; p=0.980) at 6-month follow-up. Moreover, the PS-adjusted survival curves also showed no differences in the proportion of surviving and free of MACE between the two periods (figures 1 and 2). Regarding complications related to revascularisation procedures, there were no differences between the conventional cTn and hs-cTn periods in periprocedural death (n=1, 0.1% vs n=3, 0.4%; p=0.4) or non-fatal myocardial infarction (n=19, 2.7% vs n=23, 3.4%, p=0.5). The periprocedural non-fatal myocardial infarctions were not considered within the clinical MACE. For the analysis of the LOS, patients who underwent coronary surgery at the index hospitalisation were not considered. Therefore, a total population of 1280 patients were analysed, 659 from the conventional cTn period and 621 from the hs-cTn period. The LOS was higher in the hs-cTn period (5.9±3.6 vs 5.4±3.9 days, p=0.02) and the proportion of patients with a LOS longer than the median (5 days) was also superior in the hs-cTn period (63% vs 56%, p=0.005). In the PS-weighted regression analysis, the use of hs-cTn was significantly associated with higher risk of LOS longer than the median (OR=1.35, 95% CI 1.07 to 1.71, p=0.02). The results of this study indicate that the replacement of conventional cTn by hs-cTn modified the management of non-ST-segment elevation acute chest pain patients. The number of coronary angiograms and revascularisations performed at the index episode increased, while the number of patients initially evaluated with non-invasive stress tests in the chest pain unit decreased. Pharmacological treatments for acute coronary syndromes also increased. However, all these changes were not associated with changes in clinical outcomes at 6 months. hs-cTn unveils cTn elevation in some patients who otherwise would initially pass undetected using a conventional assay. In our study, the frequency of cTn elevation leading to a diagnosis of non-ST elevation AMI was twice higher in the hs-cTn period. Conceivably, using conventional cTn, these patients would have eventually been detected after evaluation in the chest pain unit, though they would have been classified as with unstable angina. Indeed, the frequency of unstable angina diagnosis was higher in the conventional cTn period. The net consequence of this change in management policy is that hs-cTn simplified chest pain triage by avoiding a longer and more complex assessment in the chest pain unit in some patients. Evaluation in the chest pain unit often requires non-invasive tests such as an exercise test, imaging stress test or CT angiography.13 ,18–20 The drawback of using hs-cTn is that fewer patients can be directly discharged because more coronary angiograms are indicated as a consequence of hs-cTn elevation. In fact, our data show that the LOS was longer in the hs-cTn period. In addition, the excess of invasive management can lead to an inappropriate number of revascularisations. This was a sequential two period cohort study from a single centre and some confounding variables cannot be excluded. However, the baseline characteristics were roughly similar in both periods and PS analysis was done to compensate for these differences. The management and evolution of patients with chest pain not considered of possible coronary origin by the cardiologist in charge were not recorded. The follow-up period was 6 months, and so the effect of using the hs-cTn assay over longer follow-up was not assessed. Therefore, the results of this study should not underestimate the potential long-term benefits of diagnosing coronary artery disease thanks to hs-cTn, in particular as regards the introduction of secondary prevention medications such as statins in patients in whom ischaemic heart disease would not have been recognised otherwise. The introduction of hs-cTn in hospital practice modifies the management policy of acute chest pain towards a more aggressive approach in terms of invasive management and revascularisation procedures. However, no benefits in terms of mid-term prognosis were observed. The results of our study suggest that careful clinical evaluation and diagnosis workup are advisable in some patients with chest pain and hs-cTn elevation before routine invasive management is indicated. Further studies are needed on how to optimise the information provided by hs-cTn for patient management. What is known on this subject? Currently, high-sensitive troponin (cTn) is substituting conventional cTn in many hospitals, but there is scarce information regarding how this change is modifying patient management and outcome. Our results suggest that high-sensitivity cTn use did not improve mid-term prognostic data. Further studies are needed on how to optimise the information provided by high-sensitivity cTn for patient management. The authors thank Estefania Montalvo for the management of the database.
. ESC Guidelines for the management of acute coronary syndromes in patients presenting without persistent ST-segment elevation. Eur Heart J 2011;32:2999–3054.
. High-sensitivity cardiac troponin: from theory to clinical practice. Rev Esp Cardiol. 2013;66:687–91.
. Prospective evaluation of the prognostic implications of improved assay performance with a sensitive assay for cardiac troponin I. J Am Coll Cardiol 2010;55:2118–24.
. Usefulness of high-sensitivity troponin T for the evaluation of patients with acute chest pain and no or minimal myocardial damage. Am Heart J 2012;164:194–200.
. N-terminal pro-brain natriuretic peptide and high-sensitivity troponin in the evaluation of acute chest pain of uncertain etiology. A PITAGORAS substudy. Rev Esp Cardiol 2013;66:532–8.
. Early diagnosis of myocardial infarction with sensitive cardiac troponin assays. N Eng J Med 2009;361:858–67.
. Sensitive troponin I assay in early diagnosis of acute myocardial infarction. N Eng J Med 2009;361:858–68–77.
. Implementation of a sensitive troponin I assay and risk of recurrent myocardial infarction and death in patients with suspected acute coronary syndrome. JAMA 2011;305:1210–16.
. New risk score for patients with acute chest pain, non-ST-segment deviation and normal troponin concentrations. A comparison with the TIMI risk score. J Am Coll Cardiol 2005;46:443–9.
. Usefulness of early exercise testing and clinical risk score for prognostic evaluation in chest pain units without preexisting evidence of myocardial ischemia. Am J Cardiol 2006;97:633–5.
. Identification of very low risk chest pain using clinical data in the emergency department. Int J Cardiol 2011;150:260–3.
. Improving propensity score weighting using machine learning. Stat Med. 2010;29:337–46. Ridgeway G, McCarey D, Grin BA, et al. Twang: Toolkit for weighting and analysis of non-equivalent groups. 2006. http://cran.fyxm.net/web/packages/twang/.
. Flexible parametric proportional-hazards and proportional-odds models for censored survival data, with application to prognostic modelling and estimation of treatment effects. Stat Med 2002;21:2175–97.
. Clinical and economic impact of stress echocardiography compared with exercise electrocardiography in patients with suspected acute coronary syndrome but negative troponin: a prospective randomized controlled study. Eur Heart J 2007;28:204–11.
. Prognostic and therapeutics implications of dypiridamole stres cardiovascular magnetic resonance on the basis of the ischemic cascade. Heart 2009;95:49–56.
. Outcomes after coronary computed tomography angiography in the emergency department. A systematic review and meta-analysis of randomized, controlled trials. J Am Coll Cardiol 2013;61: 880–92.
. Real-world application of “delta” troponin. Diagnostic and prognostic implications. J Am Coll Cardiol 2013;62:1239–41.
. Small changes in troponin T levels are common in patients with non–ST-segment elevation myocardial infarction and are linked to higher mortality. J Am Coll Cardiol 2013;62:1231–8.
. Reference population and marathon runner sera assessed by highly sensitive cardiac troponin T and commercial cardiac troponin T and I assays. Clin Chem 2009;55:101–8.
. Predictive value of cardiac troponin I and T for subsequent death in end-stage renal disease. Circulation 2002;106:2941–5.
. Early diagnosis of acute myocardial infarction I patients with pre-existing coronary artery disease using more sensitive cardiac troponin assays. Eur Heart J 2012;33:988–97.
. ACCF 2012 expert consensus document on practical clinical considerations in the interpretation of troponin elevations. J Am Coll Cardiol 2012;60:2427–63.
. Efficacy of coronary revascularization in patients with acute chest pain managed in chest pain unit. Mayo Clin Proc 2009;84:323–9. Contributors The contributions of the authors were as follows: (1) Conception and design: JS and JN. (2) Collection and analysis of data: SG-B, LM, AM, LA, SV and CB. (3) Interpretation of data: JS, EN and JN. (4) Drafting of the manuscript or revising it critically: JS, LC, MR, FJCh, EN and JN. (5) Final approval of the manuscript submitted: All authors. Funding This work was supported by grants from Spain's Ministry of Science and Innovation through the Carlos III Health Institute: HERACLES RD12/0042/0010, FEDER; Health Research Fund FIS PI 11/ 01595; and FI12/00467. Ethics approval The study was reviewed and approved by the ethics board of the University Clinic Hospital of Valencia.